A phone holder can be super useful, especially when you’re looking to organise your home or desk! But why buy one when you can create your own with one very simply material – foam! 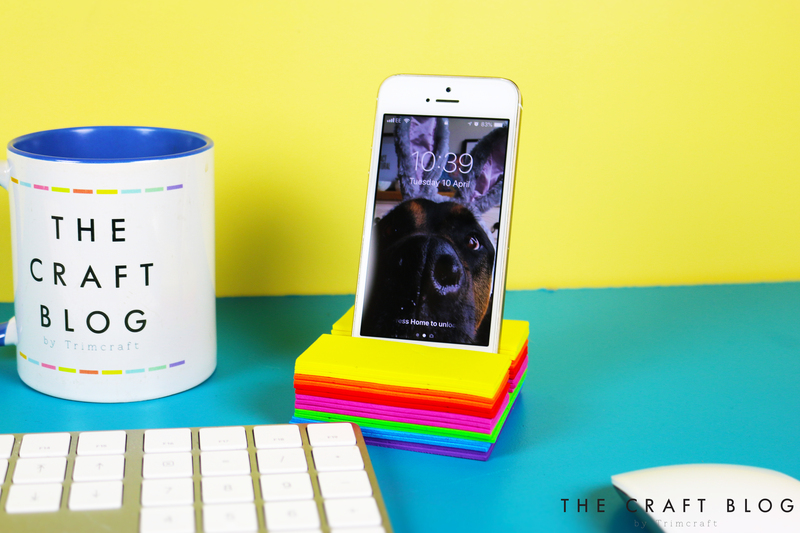 Today we’re showing you how to create this cool, colourful phone stand using the Dovecraft A4 foam sheets, ideal for adding a pop of colour to your workspace. This is so easy to create that you’ll be making your own in no time at all. We also created a video tutorial of this make, click the thumbnail above to watch! 1. Start by cutting two 7.5cm x 7.5cm squares from your A4 sheets of purple, blue, green, pink, orange, and red foam. 2. Begin to carefully layer the larger pieces of foam on top of each other, adhering with strips of double-sided tape as you go. 3. Now you will need to cut our smaller pieces of foam to size. We cut four pieces of yellow, orange, pink, and red foam to 3.2 x 7.5cm. 4. Just like before, adhere your smaller pieces of foam to the top of your foam base, colour by colour, but making sure that you line the small rectangles up to the edges of the square base, so that there is a small gap in the centre of the square in which to rest your phone. Your phone stand is now complete. This would be a super cool way to keep your craft desk tidy and will ensure that you don’t lose your phone under all of your craft supplies! What do you think to this quick and easy phone holder tutorial? We’d love to see if you create your own! Don’t forget to #Trimcraft when uploading to social media and to share your projects in the Inspiration area. First of all thank you so much for showing you how to create this cool, colorful phone stand using the Dovecraft A4 foam sheets, ideal for adding a pop of color to your workspace. Well enjoyed this post very much, such a out standing post. I like such works to show our own creative skills. Actually I was searching for a writing guidance and got https://essayservices.org/ to complete my educational assignment with less effort. And also sure I will try this colorful phone stand.